Stop losses are a form of trend following in which you switch from risky assets, such as stocks, to a risk-free or fixed income asset after there are pre-determined cumulative losses. The random walk hypothesis (RWH) was widely accepted in the 1960s and 1970s. It was synonymous with market efficiency. It effectively eliminated any academic interest in stop loss rules. Under RWH, with stock returns being independent, stop losses would decrease a strategy’s expected return. There remains a cultural affinity to RWH despite strong contrary evidence now. This may explain why there is still considerable indifference to stop loss policies and trend following in general among institutional investors who were schooled in old academic ideas. 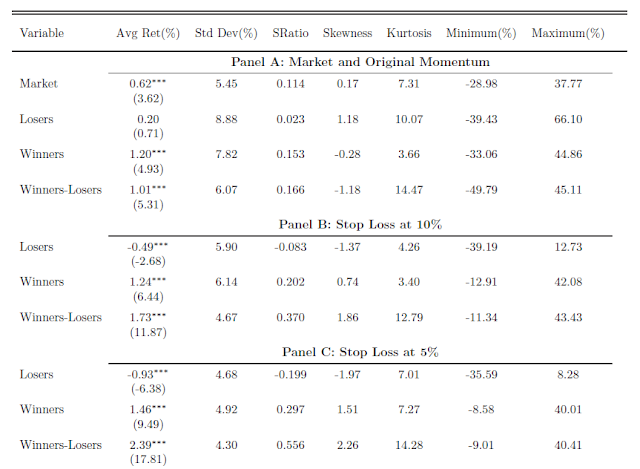 In their paper, “When Do Stop-Loss Rules Stop Losses?”, Kaminski and Lo (2013) show both mathematically and empirically that if stock returns have positive serial correlation (there is overwhelming evidence they do), then stops can add value. Over monthly intervals using daily stock futures data from 1993 through 2011, the authors found that volatility-based stop loss rules could increase monthly returns 1.5%, while substantially decreasing volatility. They found that slower moving stops worked best. In “Taming Momentum Crashes: A Simple Stop-Loss Strategy”, Han, Zhou, and Zhu (2014) showed the effectiveness of a stop loss overlay applied to a momentum-based strategy. The authors examined the top decile of U.S. stocks from 1926 through 2011 based on relative strength momentum over the preceding 6 months (the authors showed similar results using 12-month momentum). They sold any stock if it's daily opening or closing price dropped 10% below the beginning price of the month. They followed the same procedure for short positions. Portfolios were rebalanced monthly. This stop loss strategy raised the average monthly return from 1.01% to 1.73% (buy and hold was 0.62%) and reduced the monthly standard deviation from 6.07% to 4.67%. Momentum crash risk (from short positions) was completely eliminated. Results from using a 5% stop were even better. 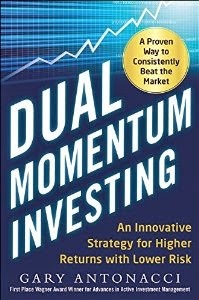 The worst monthly return for buy and hold was -28.98%, while the worst monthly return for an equally weighted momentum strategy was -49.79%, showing the increased risk from applying relative momentum to individual stocks. 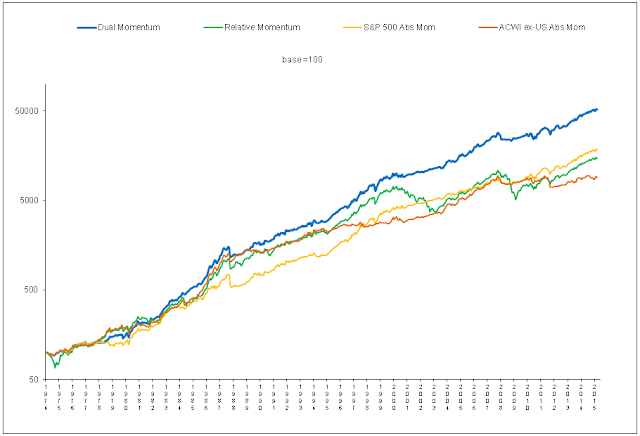 A 10% stop loss overlay improved the worst monthly return to only -11.34%. For value weighted rather than equal weighted portfolios, the maximum monthly loss for momentum and 10% stop loss portfolios were -65.34% and -23.69%, respectively. Average returns and Sharpe ratios doubled by using stops. However, added transaction costs may significantly reduce the advantage of stops. This stop loss strategy also had a positive skewness of 1.86, versus a negative skewness of -1.18 for the original momentum strategy, indicating a dramatic reduction in left tail risk when using stops. 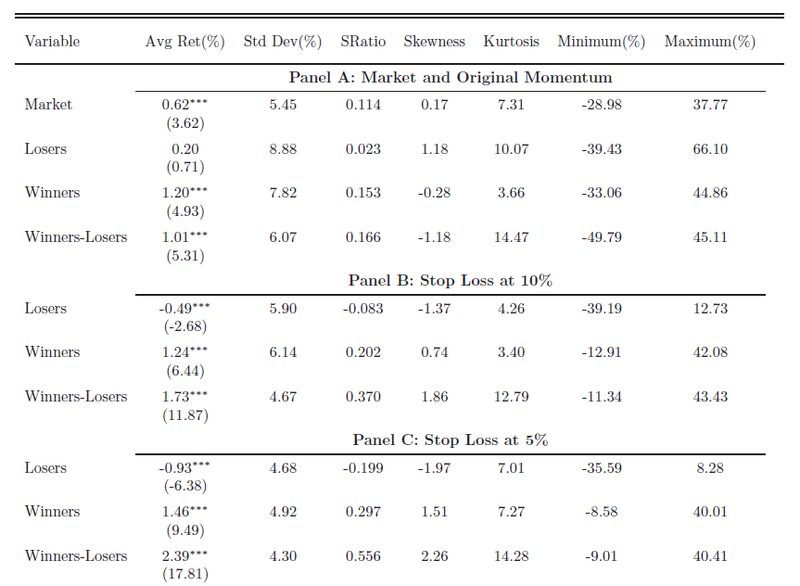 Both these papers show theoretically and empirically that risk control overlays, such as stop loss rules, can have dramatically positive effects on relative momentum-based strategies. This applies also to other trend following methods of risk control, such as moving average filters and absolute momentum, that can work as well or better than stops (the subject of a future post). Stop losses and other trend following methods are a way to head off some of the usual pitfalls of human judgement, such as the disposition effect, loss aversion, ambiguity aversion, and the flight-to-safety response. Stop losses increased trading activity by 40%, but increases in return of about 70% helped overcome these high transaction costs.